A few years ago I did a little private meme, collecting all the scary books I reviewed in October. This year I invite you to join in! Just post your scary book review in the comments and I'll collect them here throughout the month of October. You can add "Read Scary" to your title and labels as well. I picked this up for my own enjoyment, since I thought the description sounded fun. Only afterwards did I realize it's the same author who is bringing out the Ninja Meerkats series, which several boys at our library are delighting in. Mr. Lapsewood is a dull but dutiful civil servant. He's also a ghost. When he gets forced out of his comfortable loop, he's not quite sure what to do. 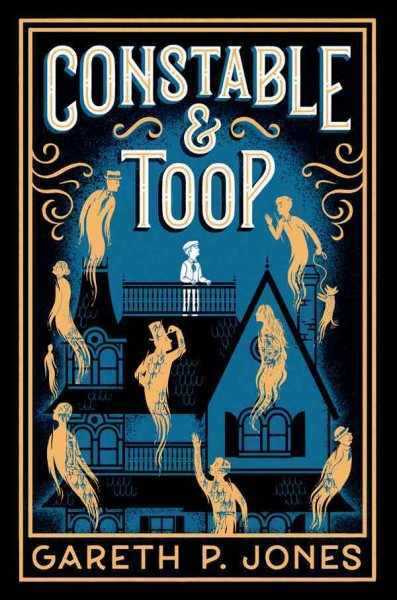 Sam Toop is an undertaker's son who can talk to ghosts, but that doesn't help him find out his father's secrets any faster, or protect him from his villainous uncle. Eventually, the two meet and must figure out a way to stop the Black Rot, a dangerous infestation that is destroying ghosts and could move on to the living at any time. At almost four hundred pages, and with each chapter featuring a different protagonist or event, this novel isn't for the reluctant or fainthearted reader. It's not exactly a scary book, although it features ghosts and nameless horrors and not a few dead bodies. It is, in fact, exactly what the author describes it as being; an inspiration from Victorian ghost stories and of course Dickens' London. Like historical London, it's a rather wandering story, drifting from one historical snippet to another and gaily tossing in new characters wherever a spare place presents itself. The action doesn't start building to a climax until nearly the final chapter and the final denouement falls a bit flat, as if the author was having so much fun writing the book he forgot he was going to have to end it at some point. Verdict: All that being said, I really enjoyed this book. I wouldn't recommend it to Neil Gaiman fans, as the back copy suggests, but Eva Ibbotson fans definitely. It isn't for the average reader, but if you have a child who is a voracious devourer of words and likes to sink into a world with lots of interesting characters, villains, and a little spookiness along the way, this will be a perfect gift. It's not something I'll purchase for my library, since I can't get anyone to read Eva Ibbotson and I only have a few kids who will pick up books of this length, but if you have a larger audience (and budget) go for it. 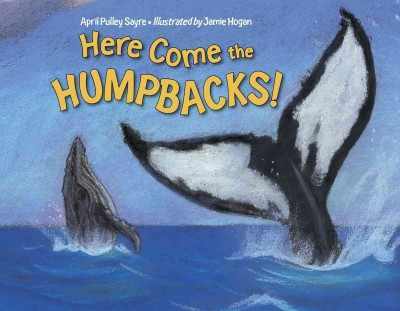 Sayre follows a humpback from birth, through migration, and back to the warm waters and the beginning of adulthood. There are three levels of text, at the beginning and end and in a few selected spots are simple, bold sentences. The bulk of the book consists of simple descriptive paragraphs describing the whale's birth, journey and growth. Each page also includes, in smaller type, additional information about ocean creatures, the humpbacks, or some of the threats they face both natural and man-made. Jamie Hogan's illustrations will be familiar from A Warmer World and while I usually prefer photographs, after a few readings I came to appreciate her thick, lush charcoal pencil and pastels.The thick, textured paintings give a warmth and mystery to the whale's underwater world and is hard to capture with digital images. This follows what I think is the best pattern for easy nonfiction; several levels of text to follow. Very young children can enjoy the pictures and large text with a few snippets from the paragraphs. Preschoolers will be able to sit still for most of the descriptive paragraphs. Older kids, or those that are really interested in the subject, will pick up on the extra fact sections. Verdict: This will be a nice addition to a storytime collection or easy nonfiction. Recommended. It could be worse, yes, but it was one of those weeks where I wished I could just stay home and read and sleep and take copious amounts of decongestant. Monday - still have a sinus infection, can't take pills at work (b/c I have to drive and they make me floaty) and had a dentist appointment. Confusion over concept book order, printers crashing, many annoyed patrons, did manage to get the rest of October planned. Oh, wait, that's less than two weeks. Oh well. About 3-4 families came to read to Max (not the one that had signed up, but whatever) and Max was very pleased to make new friends and smell interesting things at the library. Then I just had an evening on the desk to constantly blow my nose and try to place av orders with a splitting headache and cramps. But I only made one minor error on the orders (I hope) and I made it home alive! Ah, sweet decongestant. Tuesday - huge groups at toddler storytime in the morning, interspersed with discussions about furniture and I did something else but can't at the moment remember what it was. Then I had two school visits in the afternoon. Happily, my throat isn't too sore anymore and only one class came at a time, which is much easier to deal with. It was rather a scramble, as a number of things went wrong at the last minute, but we got it all taken care of and all the kids checked out books to take back to their classrooms. Then I took care of a number of minor things and around 3:30 wondered why I felt so sick, which was when I realized I hadn't eaten any lunch! I grabbed something to eat, interrupted by yet another toilet catastrophe (one I didn't deal with - I only plunge toilets I do not clean up the aftermath, or if someone has decided to...not use the toilet, ifyouknowwhatimean) and then a hasty departure of all the staff going to the state conference and I finished up a bunch of misc. stuff on my desk. Hopefully, I will not forget to feed the director's cat, or let it escape, or anything too traumatic! Took myself and my headache and congested sinuses home to wrestle with baking the rapidly expanding dough in the refrigerator. Wednesday was mostly really quiet, which was good, since I had a sinus headache for most of the day and the computers were behaving in a manner calculated to make a saint scream. I had a small but happy group for storytime in the morning, then dealt with a miscellany of things (happily not involving toilets) until I was on the front desk starting at 1:45. Then the printers, various computers, and finally the information desk computer itself refused to cooperate and I finally moved back to the children's desk at 3pm, where I prefer to be anyways, especially since, among other things, the front desk computer is sized weirdly and we couldn't fix it. It was a really quiet day, other than a lot of random weirdness. I did not forget to feed the World's Friendliest Cat, who was very sorry to see me leave. I did try to explain that I am allergic to cats, but he was very firm about there being Petting in addition to Food. Thursday was a long day - I normally don't go in to work until 9:30, since I stay late, but I had to open so I was there before 9. The information desk computer was still slow as molasses, I dealt with a number of annoying information desk questions (how do I print, make a reservation for me, where is x, etc. etc.) which I normally wouldn't mind but I was feeling so annoyed that they were annoying and by the time my desk shift was over I just wanted to scream. This is why I am the children's librarian, NOT a reference librarian! I will be very glad when everyone returns from the conference. I am also going nuts because I lost a book - I borrowed it from another library for Cybils, I know it was on my desk at work (along with 50 million other things) but I cleared everything off and I CAN'T FIND IT. I am still working on some weeding projects and...I just found a book...that was repaired...with medical tape. WHY?? And there go the toilets again. Even the prowess of the Official Toilet Plunger (me) cannot save this one and the city works department were called, much to their annoyance. Hey, if I'm annoyed, everybody's annoyed. Lots of people came to Mad Scientists Club and although several boys loudly argued that "color is not science" they enjoyed it just the same. Then I left my aide to clean up (I will owe her cookies) and came home, not forgetting to feed the cat. Friday! The end is in sight! I miscalculated in how much clean-up I left and several other staff had to help her out, which I will now stress over. I hate to leave a program uncleaned up, but I also hate working 10 hour days... I assured everyone that was the last paint program of the year (and I will do something different if we ever do this again) but I am going to stress about it a while longer. We had originally planned our staff development day for this Friday, so a lot of people thought we were closed, which made for a quiet day, or half-day, and only a few people came to We Explore. I just left the room open so people could drop in and make something. I will clean it up on Monday...didn't finish my shifting project, but at 1:30 I made myself leave anyways. I will go to work early Saturday to work on it. Saturday, the last day of the endless week. Came in to work around 8:30am and finished my shifting/collection development project. We opened at 10am and I decided to open the Storyroom up again and let people make stuff with the craft materials left out from Friday. I would really like to do this every Saturday, but haven't convinced the staff that it's a good idea yet. It's messy in there, yes, but nobody brought anything out (except their creations). I worked through stacks of new books, the detritus of my weeding project, had a discussion with my aide about shelving in the juvenile fiction (my project area) and the signage we're going to make for the children's area. Then we all stayed late because of a patron issue and I finally got home around 2:30. Phew! What a week! 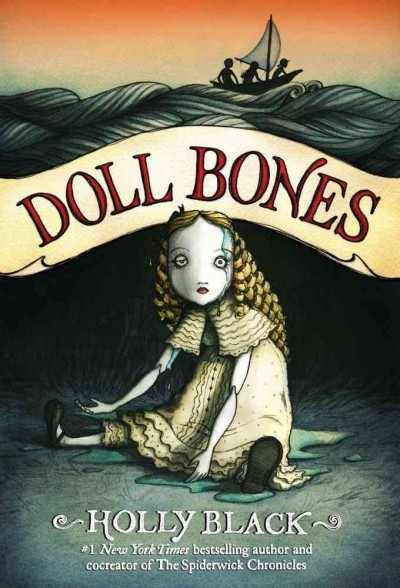 When I first started reading this dark and haunting story, it seemed pretty similar to a lot of other stories. Mysterious, fantastical creatures, a chosen one, cryptic prophecies, a land in jeopardy, a horrible monster, etc. However, as I got pulled into the story I found that while it may not be wildly original, it's so well-told and illustrated that it doesn't matter. Nate is feeling helpless and depressed about moving. When his dad says he can pick out his own room, he bitterly says "Hurray for me...I finally get to have a say in this move." But what he finds in the tower room is beyond anything he expected. Nate is fascinated by the recordings a lost boy left behind and the cryptic hints of the girl next door and delighted when he begins to see some of the magical creatures Walt's recordings talk about. But events take a darker turn and Nate quickly realizes he's caught up in a war he doesn't understand with terrifying dangers. Will he triumph with the help of his new friends, or will he become lost like Walt? The spooky black and white art gives the story both a chilling and a vintage feel. The flashbacks to Walt's story are bordered in black and even darker than Nate's story, showing the darkness that eventually takes over Walt. As the story progresses, it grows more complex including themes of community and forgiveness and the effects of difficult choices. Think of a creepy faerie story crossed with Toy Story with overtones of Kaza Kibuishi's Amulet series and that about covers it. 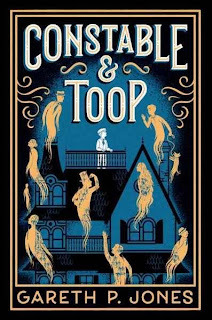 Verdict: Fans of Amulet and Bone will really love this one, and older fans will want to move on and read Holly Black's Neighbors trilogy (think teen) while younger fans may enjoy the lighter Sybil the Backpack Fairy if they're not quite ready for the darkness of this story. The black and white art and general lowering feeling of the story won't be for everyone, but kids who like fantasy adventure graphic novels will definitely want to read this. This is proof that you should never read other reviews before the actual book! I received this review copy back in May, stuck it on the shelf, and promptly was absorbed into summer. When I started getting to my reviewing backlog, I had read a lot of reviews that all pretty much summed up the book as "amazing and scary" so I scheduled a spot for it in my Read Scary meme and then read the book. Well, amazing perhaps, but I wouldn't really say it's scary. At this point, you've probably seen quite a few reviews, but the basic plot is that Zach, Poppy, and Alice have a complex imaginary game with action figures, dolls, and a constantly changing series of plots. When Zach's dad, back in his life after several years of being gone, decides 12-year-old Zach needs to grow up and throws out all his action figures, props, and the questions they trade back and forth in school, Zach is devastated. He doesn't know how to tell Poppy and Alice, so he says he's too grown-up to play the game anymore. Poppy, desperate to get her friends back, comes up with a new game based on the dreams she's been having about The Queen, the antique china doll she's sneaked out of her mom's display case. Together, the three set out on their first real quest, one final adventure, each searching for something different. This is a beautifully crafted story. There are so many wonderful parts, all smoothly woven together. Holly Black really gets that feeling of in-between for middle school kids where they're not adults, but not kids and kind of scared of what happens next. Not every kid is going to think this deeply about it, but for those introspective, dreamy kids this book will hit all the right notes. It's a magical story of imaginative play with the stories they tell taking on a life of their own. I'd also add how much I love that the librarian is a sympathetic, but wholly adult figure. I've gotten a bit annoyed by the portrayal of librarians as sort of Manic Pixie Dream Girls for kids. Yeah, we like kids, yeah we want them to love books, but we are still ADULTS. I also noted with approval that the crazy old guy they meet is just that - a crazy, weird, frightening guy. Having interacted with many people who are have mental and addiction issues, I can safely say that while I feel sorry for them, I don't think they have any secret mystical knowledge to impart. This is now turning into a diatribe on what I don't like about other books...anyways. I also loved Eliza Wheeler's evocative illustrations. It reminded me of Zilpha Keatley Snyder's Egypt Game. Verdict: Will this book be for every kid? No. 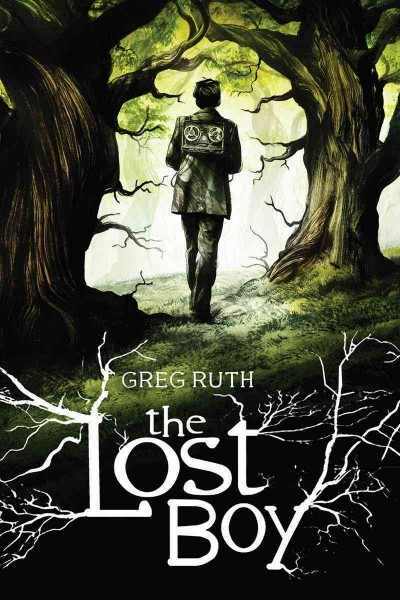 Kids expecting a seriously spooky story or a classic adventure will be disappointed, but kids who want to think a little more about growing up and who like a mysterious story with riffles of fear will treasure this book. I'd put this one in the order list for the couple books you buy for the kids who want something a little different and I wouldn't be surprised if it won some awards. I also wouldn't be surprised if it got challenged at some point, since it deals very realistically with kids' fears and feelings, although there's nothing overtly "inappropriate" in it. 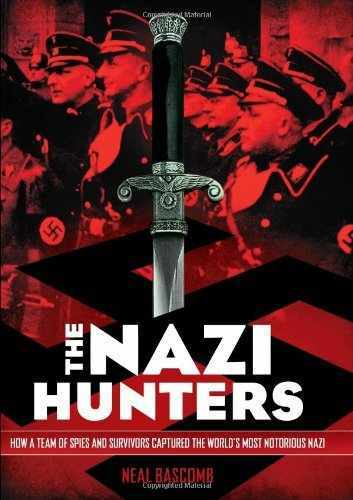 This is the young reader's edition of Neal Bascomb's 2010 book, Hunting Eichmann. I haven't read the original adult version, so I can't compare the two, but I thought this version was pretty good. The story begins with a tense and mysterious prologue, set in 1960, and then jumps back to 1944 and introduces Eichmann setting out for Hungary where he was responsible for the transport of Jews to concentration camps. As the story slowly builds, Bascomb introduces more characters - the Jews who escaped or survived the Holocaust and remembered Eichmann, the various agents who gathered information on him, the Argentinian Jews who discovered him in hiding, and the politicians who finally gave the go-ahead. The story starts moving faster once the team is formed and Bascomb gives a blow-by-blow account of Eichmann's capture and the team's escape from Argentine. The story ends with Eichmann's trial and a discussion of how his capture affected history, especially in regards to the Holocaust. There is copious background and supplementary material including lists of participants, detailed source notes and an author's note. The book itself includes photographs and images of source material, such as doctored passports and ids. 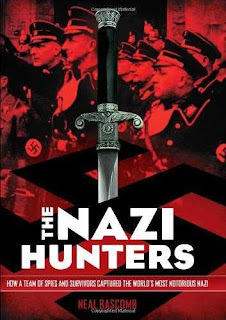 While the book isn't quite as pulse-pounding as it would seem to be from the subject matter, and in fact drags in some places when describing actions down to the nth degree, this is an historical account that will definitely grab the attention of kids who are aficionados of World War II. It doesn't shy away from the harsh realities of the Holocaust, but there are very few descriptions of any atrocities and those that are included are presented in a brief, matter of fact tone. The age ranges I've seen for this are mostly grades 7-9, but I feel comfortable putting it in the juvenile nonfiction and recommending it to 5th grade and up. Verdict: World War II is a subject that always seems to interest kids at a certain age and this is a great addition to your nonfiction section for those kids hungry for more detailed chapter books. It's also a good stepping off point for kids who are ready to move up to the adult nonfiction history section. Bascomb does a good job of building the story with strong research to back up every aspect and setting the stage for discussions afterwards. Definitely recommended. ISBN: 9780545430999; Published September 2013 by Arthur A. Levine/Scholastic; ARC provided by publisher at ALA annual 2013; Purchased for the library. This week was very outreach heavy. My voice is suffering. Do I have a sore throat or is it just the result of back to back storytimes with kids who have not had outdoor recess? For a number of reasons I suddenly realized I had to plan the calendar for winter/spring 2014 NOW. I finished my massive concept book project! Every single book in the concept section (a couple hundred? I'm not sure, it was a lot) I looked at the circulation, the condition, I selected replacements, I repaired, I decided where they would be sent - to picture books, to nonfiction, to the delete pile, and then I made additional selections to replace those titles that were out of print or which I no longer wished to sully my library's shelves. Question solved: I have a cold, or a sinus infection, or something. Looking forward to lots of tea and sleep this weekend. I'm not personally a fan of Cammuso's popular Dodgeball Chronicles trilogy, since I really dislike Arthurian legends in pretty much all forms, but kids love the silly puns and strong animated style. I was really annoyed when I discovered his books were only available in Graphix' flimsy paperbacks or expensive prebinds and I couldn't easily replace our damaged/missing copies. So, I was excited to see he's debuting a new series with Amulet, and a beginning chapter one no less! 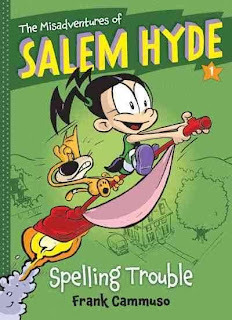 Salem Hyde is, as one might guess, a witch in training. Unfortunately, after one too many mishaps (who knew they were talking about spelling words and not casting spells?) her parents decide to get her a M.A.C., a Magical Animal Companion. Enter Mr. Whamsford, who is expecting a normal little witch and gets Salem, with all her foibles and mistakes. Salem isn't too happy either since she wanted a unicorn! When Salem accidentally gets picked for a spelling bee and things spiral out of control, she and Whammy will have to solve their differences and learn to be friends. From the beginning the book plunges right into silly humor as Salem accidentally turns the ancient crossing guard into a dinosaur. More humor is supplied by the suspicious teacher, Mr. Fink, who seems to be the only one who sees Salem's shenanigans. Of course there's a mean girl, some wild vacuum rides, and plenty of spelling mistakes, both magical and mundane. The galley I received was in black and white, but the final book will be in color. One inner plate showed just hues of green, but going by the cover and Cammuso's previous work, I'm assuming there will be full color throughout the story. The art has a classic cartoon feel with exaggerated eyes, deft lines and strokes filling in emotion, and easy to follow action moving from panel to panel. The storyline and art style isn't particularly ground-breaking or unique, but kids will love the humor and easily recognizable art style. Verdict: A great filler for your graphic novel section, full of the easy humor that kids love and comic strip-style art. This will be another popular series from Cammuso and I highly recommend adding it. So, I was at ALA last summer and I was whizzing through the exhibits hall, on my way out before they turned the lights out and I spotted purple streaked hair and some familiar looking books and OMG IT'S FAITH ERIN HICKS TOTAL FAN MOMENT. She was awesome. Ahem. So, why you should buy this for your library. So, this is a horror comic *cue spooky music*. It's pretty obvious from the opening, which shows a couple camp kids hiking through the woods...until they suddenly start sprouting feathers and then coughing them up before they collapse. We go next to our main characters, Jenna and Lucas. Both are disappointments to their families; Jenna is a comic-loving, geeky, normal girl in a family of high-powered academic achievers and Lucas is sliding into bad company, stealing cars to impress his "friends" and trying to get away from his miserable home and alcoholic mother. Both families are thrilled when they get a mysterious offer for a summer camp that promises to turn their kids around...but Jenna and Lucas are less than happy. They both quickly realize that camp is just a smaller setting for their miserable lives with bullies, horrible food, and mysterious....dead...baby birds. Not to mention the missing campers and sudden, odd intelligence of the zombie-like other campers. 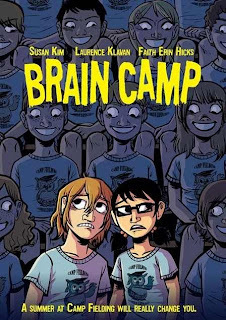 With a mixture of luck, determination, and friendship they manage to solve the horrifying mystery of what's really going on at Brain Camp and the horror is over. Or....is it? One of the things that's cool about being a fan of Faith Erin Hicks from way back in 2007 with Zombies Calling (Joss, you and your spork will always hold a place in my heart) is that I get to watch how her art style develops with each new story. This is her third published work and the first to be in color. Her first two print comics had a rough style, lots of lines and movement, but in this novel she really refines her art. The characters are slicker and smoother but at the same time have more depth and emotion. It's not just a horror comic or a mystery - it's about real kids dealing with an unusual situation. That is what I've come to expect from the books she illustrates and collaborates on and this showcases her artistic ability as well as her feeling for the story. 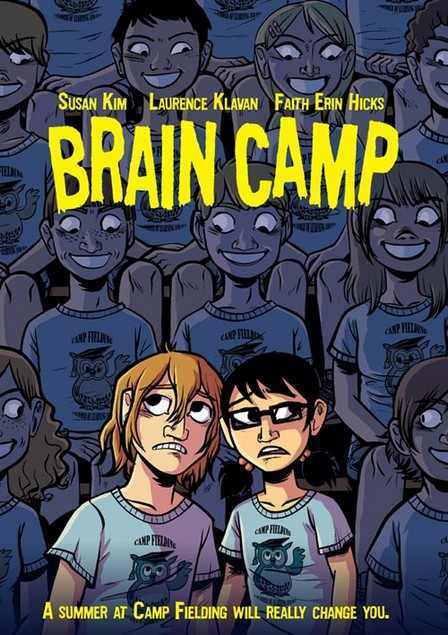 Susan Kim and Laurence Klavan have written a story that is not only a perfect plot for Faith Erin Hicks' artwork (always the best part in my mind of course) but also that is spot-on for middle school readers. Not every kid is alike, but every kid will recognize how difficult it can be to live up to parental expectations, to deal with difficult situations and bullies, and just general growing up, whether there are alien monstrosities turning you into zombies or not. 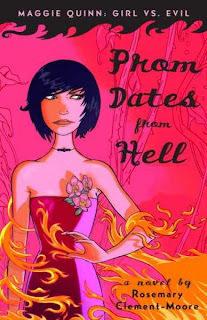 Verdict: School libraries will want to be cautious on this one; it's frank and open about the facts of life - Jenna gets her period and Lucas has a dream about Jenna with a predictable result, but middle school kids wanting real stories about real kids - with a little mystery and a lot of horror thrown in - will love this. My patrons don't often check out graphic novels (as opposed to manga or cartoon strips or superhero comics), but Faith Eric Hicks is always a popular choice and this is no exception. After I met April Pulley Sayre at ALA (and ok, I am not a big celebrity author fan kind of person, but I do like meeting authors that I think are important; like Sayre, who is one of the authors who pioneered a new writing style of nonfiction for very young children) I had the urge to go back and read through her backlist. This is one I hadn't seen before and I can't believe I missed it! We love Sayre's fruit and vegetables chants and I was delighted to discover that she has a fish chant. This is especially apropos for our area, which has a gazillion lakes and most kids have gone fishing, or eat fish regularly. 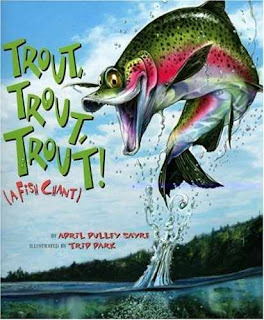 There's a swinging rhythm to the choice of fish names that would make this a rousing storytime read, "Threespine Stickleback, Freshwater Drum/Lake Chub, Creek Chub, Chum, Chum, Chum." Read this a couple times through and you'll find the kids chanting it along with you. The illustrations are also a big draw. Park has a wildly different style than the more photographic or collage styles that are usually paired with Sayre. He's a cartoonist and his fish are wildly exaggerated with gaping mouths, bulging eyes, and accessories from water skis to magnifying glasses. Almost every glossy fish includes some kind of pun on their name or a joke. Verdict: I don't usually buy backlist, but this is one that should definitely have been added to the collection and I intend to remedy that. If you live in a lake area, I highly recommend purchasing it if you don't already own it. This week at the library; or, It's really fall! It's time for school visits! I was out on Monday for vacation, so I found my desk well-piled when I returned on Tuesday. I'm working on several big collection development projects as well as planning programs, etc. Wednesday was school visit and program day. I am a little exasperated that now that I have invited a preschool to join us two mornings a month, everyone has apparently decided that Preschool Interactive is THE place to be, and I am ending up with huge groups. I can't win. I am going to rearrange the room next week when the preschool comes for the first of their October visits and see if I can't make everybody happy. Thursday...I DELEGATED. I left my aide to clean up and went home. I have also arranged to turn over the teen fiction collection development to our cataloger starting next year. I feel so...adult and supervisory. The block party is a beautifully easy thing, I don't have to do anything. Our university extension has a giant room set up with 5,000 blocks. I reserve a time. They send me flyers. I bring over everyone who comes to the library and we play with blocks for an hour. I take pictures. Yay! We had over 50 people this year - it was crowded, but everyone had fun. This is more in the "weird and wonderful" category, but there are a few creepy moments. In Hilda and the Midnight Giant, Hilda has a magical adventure in the wilderness where she lives in a small, isolated house. Every day there are new things to do and discover...until she and her mother move to the city, Trolberg. Hilda wants to explore but her mother is scared of the city and doesn't want Hilda to wander away on her own. When some kids from school let Hilda join their group, at first she thinks everything will be fine. Her mom is happy she's with friends and she can explore the city. 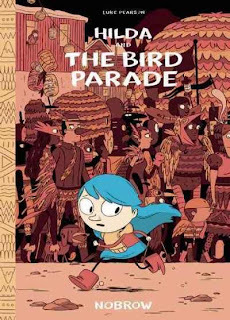 But her new "friends" aren't as interesting as she'd hoped and Hilda gets plunged into a scary adventure that slowly blossoms into a magical evening and a new friendship between Hilda and her mother. There are so many things to love about this story. First, the colors follow the plot; the beginning is earth colors, brown, orange, red as Hilda begins to explore the city in the daylight. When Hilda leaves her "friends" and goes off to explore on her own, the colors dim to grays and finally to a dark and creepy blue-gray. As the magic of the parade takes over, the oranges and red come back and glow brighter and brighter until Hilda and her mother experience the night magic of the city in a blaze of fiery color. Second, I loved the unconventional friendships. There's no stereotypical point where Hilda and the other kids figure out they both have things to offer and can make new friends. Hilda knows she's different and celebrates her difference; she doesn't need the convention, boredom, and cruelty of the other kids. Although she and her mother have some arguments, they both work things out and their relationship grows and changes by the end of the story. Third, giant magical birds. I need say no more. Verdict: This won't be for every kid, but those that love the magical and unique will devour this imaginative fantasy and delight in the art and story. If you only buy one series for the minority, buy this. This is my YA book of the year. I am not a YA person. I rarely read it (yes, I do collection development and reader's advisory for YA. There are only so many hours in the day and it's a very small part of our circulation). I do skim the books I buy but I can never work up enough interest to make it all the way through. However, every year I seem to find just one book that I completely fall in love with. This is that book in 2013. Maggie is satisfied with her mostly-invisible nerd status. She's got a few friends, academic success and she's pretty much ignoring all that weird stuff that her Gran keeps talking about. But then strange things start happening at school and to her horror she realizes that to solve the mystery (a la her secret heroine Nancy Drew) she just might have to...attend PROM. There's a delightful maybe-romance with a college student, some serious thoughts about friendship and revenge, and lots and lots of snark. Full confession: I read this after I weeded it. The whole series, actually. It made me hurt inside because even though I hadn't read them yet, I loved the description and the covers and I meant to read them sometime. But they were just not the right books for our audience. Verdict: Who is the right audience? Teens who love snark, Buffy, Veronica Mars, and self-aware heroines who are smart and not ashamed of it, able to speak up for themselves - but also know when to ask for help. This is, sadly, only a small number of teens in my town who mostly seem to prefer Twilight and Sarah Dessen (not that there's anything wrong with those). If you have teen patrons who fit this description - go forth and purchase! ISBN: 9780385734134; Published 2007 by Delacorte; Purchased for the library, weeded from same. Sigh. I assumed this was a fictional chapter book with a somewhat weird cover and was enchanted to discover it is a...well, it's kind of hard to describe. A narrative of ancient Egyptian beliefs and culture is the best thing I can think of. Our guide on this often dark and dangerous journey is Anubis, the jackal-headed Egyptian god of the afterlife, or certain aspects of it. 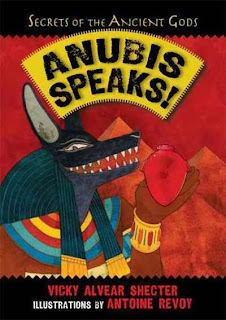 Anubis takes the reader through the journey of Ra, the sun, as he travels through the underworld in several stages during the night, battling evil gods and demons. Along the way, we learn about Egyptian mythology and beliefs as well as the culture and some of the history and geography that shaped it. Anubis is a gleefully gruesome narrator, talking about his duties of weighing hearts and what happens to those unlucky enough not to measure up with ghoulish delight. With snarky asides and egocentric complaints, he narrates the function of the gods and how they functioned in the context of Egyptian culture. This isn't exactly a scary read, but it's certainly gruesome in parts, since many of the rituals include burial rites and traditions, such as how to make a mummy, and lots of fighting between gods and demons, not to mention the tortures of those who don't weigh equally on Anubis' scales. Verdict: Hand this to fans of Rick Riordan's myth-based fantasy adventures, to kids obsessed with ancient cultures and mythology, and to those who like gruesome and gory history with a touch of snarky humor. In other words, approximately 60% of any average group of 8-12 year olds. This is the first in a series and I'm looking forward to the sequels. This week at the library; or, Summer is supposed to be over! This week felt very summery with 80 degree heat, and what felt like gazillions of kids and programs and STUFF. On Monday night, one of the other staff covered my desk shift and I went to the school's Resiliency Fair and had a half a table for the library. I met some people, had some chats, it was pretty good for not a lot of effort. I'm afraid the people who staffed the fair were disappointed - I think only about 50 people came, but I was fine with my part in it. Tuesday was busy, busy, busy. Nominate for Cybils! I don't know if I'm getting old or what, but two programs a day is exhausting, especially a teen program with such variable attendance. I was totally drained by the time Middle School Madness came around, but the kids energized me enough to make it through...and then I went home and collapsed. Thursday I came in around 11ish to meet with Pattie about the early literacy night. Then I did Lego Club, and then we had the literacy program. We were supposed to have three groups. They'd get nametags in the lobby, turns meeting with the reading specialists and going on a library tour. Well, only about 30 people at the most came. So, yeah. We could have done them all in one group and I wouldn't have had to lead three tours one after another. My feet hurt. I'm thinking I really need to do something different with my school visits other than endless tours and "oh yeah, you want to visit yes, darn, schedule crazy, I'll fit you in somewhere..." and I'm looking at a bunch of different things. I like the Field Trip visits that La Crosse does, but I don't have the time to put together something like that. My neighboring library has lots of repeat visits where the kids check out, but that won't work for us either. I'm thinking of putting together something different - but simple - for each grade level and then sticking firmly to it and sending the teachers dates I am available ahead of time. I kind of did this with the offsite outreach visits and now I need to do it with the elementary school visits. Friday was vacation! I have to plan my vacation days around programs and we had no We Explore this week. This is the last of the Branches series samples that I reviewed last June and I saved what I think is the best for last. Alexander Bopp is not happy about moving to a new town, Stermont. He's even more unhappy when creepy balloon goons start showing up everywhere! Mysterious things are happening and it seems like only Alexander and the ripped-up notebook of monsters know what's going on. With a little luck and unexpected bravery, Alex manages to not only defeat the goons but make a new friend. 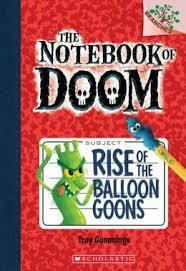 There's more mysteries on the horizon though, and more monsters in the Notebook of Doom! Not all the illustrations in this book were completed, and it looks like they will be in black and white, but Cummings has a fun, digital style that strikes a perfect line between silly and scary. Alex has darker skin and appears to have a single parent dad, but it's not emphasized, just part of his life. Like the other titles in this series, it's short (only 89 pages) but has more text than an easy reader and lots of illustrations that move the plot along. Verdict: Kids wanting something scary but not quite ready for something really scary will like the mild thrills and chills of this story and giggle at the silly aspects. 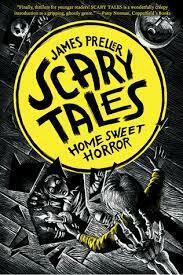 This one I would definitely recommend - there aren't enough scary books for beginning readers. Why has no one ever thought to do this before? James Preller is starting a new series of scary stories for young readers. The book is just under 100 pages, has plenty of spooky black and white illustrations, and it looks like they will be retellings of classic scary tales. Eight-year-old Liam is as thrilled as any other kid to move to a new house in a new town, especially when it turns out to basically be the haunted house of the neighborhood. In other words: Not much. He's even more nervous when he hears mysterious noises and sees mysterious things he can't explain. Then his big sister Kelly and her best friend Mitali think it would be fun to play a scary game; Bloody Mary. To their shock, the horror becomes real. Dum dum DUM. There is an appropriately terrifying but ultimately happy ending and readers are ready for the next tale of thrills and chills. The black and white illustrations are appropriately grim and gruesome without being too terrifyingly graphic. The illustrator even manages to make a simple unplugged cord look menacing! Preller manages to be scary without being overly dramatic or silly and while I wouldn't hand this series to parents who have concerns about ghosts, witchcraft, etc. the average kid will gobble them up with delight. Verdict: This is AWESOME. Perfect for kids who desperately want scary stories, but aren't ready for Goosebumps or Alvin Schwartz. Buy several copies and I promise you will not regret it.